We are running a MIAS accredited Mountain-Bike Leaders Award Level 1 and Level 2. The course is being run from our centre here at Viney Hill. The Level 1 (Non-Technical) qualification is aimed at those who wish to lead groups of beginners in non-technical terrain, such as forest tracks and canal tow paths etc. The Level 2 (Technical) qualification is aimed at those who wish to lead groups of beginners in non-technical terrain and intermediate riders who wish to ride over rocky or demanding terrain. Both Level 1 and 2 courses are run together. Full details about course content for both courses can be found at the MIAS website . The cost of the course is £225 for the weekend. 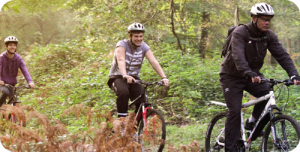 Arrangements can be made for you to borrow a high specification mountain bike to participate on the course. Places are limited If you are interested in joining the course please contact Eddie Carmichael for further details.